On Wednesday 19 April, a 70-year-old pedestrian was injured in a car-ramming attack at Gush Etzion junction in the West Bank, in the latest incident in a wave of attacks by Palestinian terrorists which began in October 2015. In a seperate incident on Good Friday, 20-year-old British student Hannah Bladon was killed in a stabbing attack on the light rail in Jerusalem. A 30-year-old pregnant woman and a 50-year-old man were also injured in the attack. 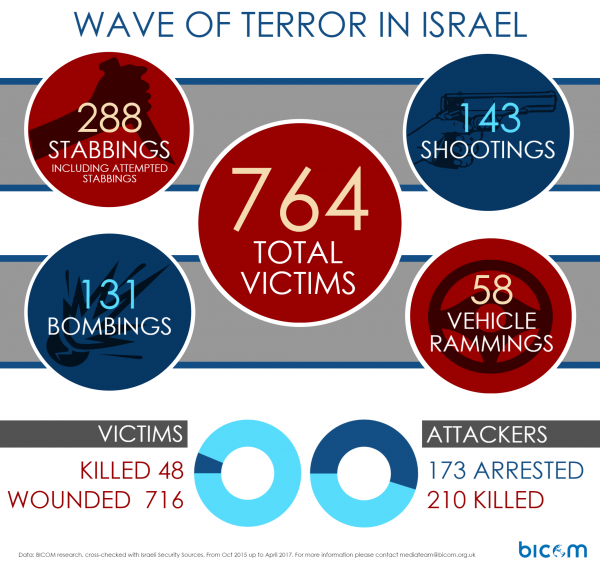 Following the two attacks, BICOM has produced the following infographic of the 19-month-long wave of terror. The infographic data is based on BICOM research, cross checked with Israeli security sources.